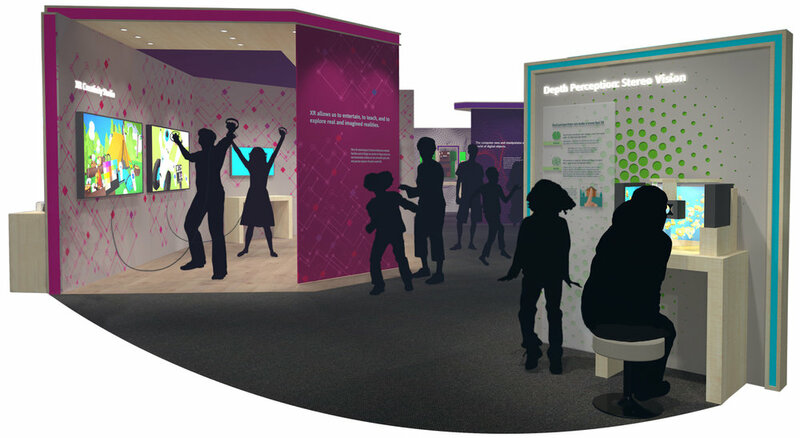 Virtual Science Center creates blockbuster, traveling museum exhibits that measurably increase kids’ interest in science, technology, engineering and math. Virtual Science Center exists to bring inquiry-based, emerging technology experiences to students outside the classroom. All of our prototypes are extensively tested and iterated with students and museum visitors. Click through the slideshow below to see which exhibits have been tested recently. Copy of VIRTUAL REALITY HEADSET LAB: Experiment with sensors, tracking, displays and lenses. Copy of EXPOSING INFRARED LEDS: The infrared LEDs (light-emitting diodes) in the VR headset that enable position tracking are revealed here. Copy of STEREOVISION: Like a VR headset, when visitors look into this large scale stereoscope, their brain fuses the right and left views so they perceive one three-dimensional image. Copy of DEPTH PERCEPTION IN VR: How is it that the fish appear to be swimming outside the screen? Understand the startling effects of depth perception in virtual reality. Copy of FULL BODY VIRTUAL REALITY: Dive into a fully immersive VR experience.